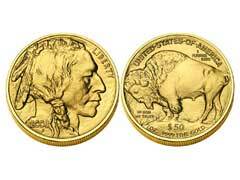 American Buffalo gold bullion coins have many advantages if you are interested in investing in gold bullion coins. Pros: These coins are unlike many other gold coins because of their high level of purity. Unlike the American Eagle gold coins, which are twenty two karat gold, the buffalo coins are twenty four karat, giving them the distinction of being the purest gold coin minted in the United States. American Buffalo gold bullion coins are highly prized by both investors and coin collectors, and they offer a beautiful design. It was first minted in the year 2006, and they have sold quickly ever since they were first released. The American Buffalo gold bullion coins can be found in a variety of sizes, making them a great choice for many budgets. You can find them in one ounce, one half of an ounce, one quarter of an ounce, and one tenth of an ounce versions. Unlike the gold Maple Leaf coins there is not a size which weighs one twentieth of an ounce though, for very small investing budgets. The Buffalos have proven just as popular as the Krugerrand gold coins and other choices in this category, even without a smaller size available. Cons: Due to their high karat composition, Buffalos are very prone to scratches if you are not handling them carefully. It’s also fair to say that they come with a hefty premium charge, almost $80 over the spot price of yellow metal for 1 oz coin. This should certainly be taken into consideration when purchasing this investment choice. However, if you choose to buy several of them at a time, your dealer might offer you a discounted rate. Other than that, American Buffalo gold bullion coins do not really have any drawbacks except for their soft metal nature and high premium, and they offer many benefits. They are often a better choice than British Sovereign gold coins or other foreign choices, and the design really stands out, and is in honor of the famous buffalo nickel. American Buffalo gold coins are a fantastic investment, with many pros to recommend them and few cons to make them a bad choice. These can be purchased directly from the US Mint arriving with certificate proving the authenticity, or a number of trustworthy online precious metals dealers.